Holiday parties, office potlucks, football tailgates — we’re in the thick of party season, people. 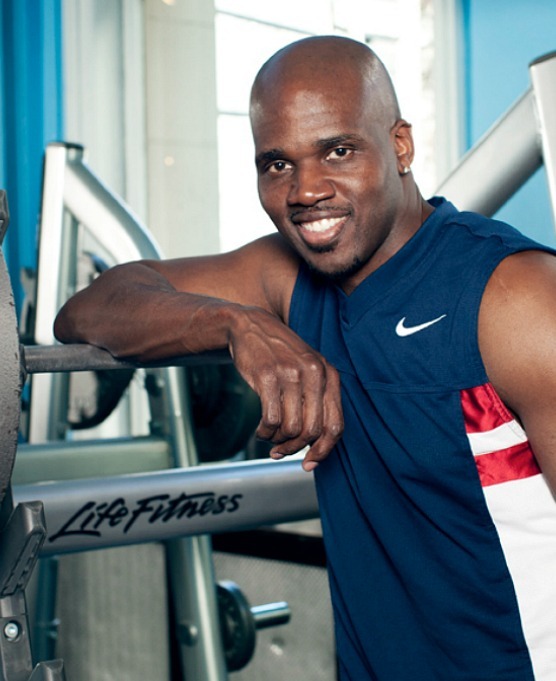 Celebrity personal trainer Reggie Chambers is here to help us stick to our healthy goals. We asked the New York City specialist in pre- and post-natal training for a couple of his top tips to get through the party season without losing steam on incorporating all those healthy habits you’ve been working so hard to stick to all year. Eat before you eat. Sounds crazy, but the easiest way to cut down on the holiday sweets is to make sure you have a healthy meal before you head out to parties. If you’re already full from a meal you’re not going to rely on high-calorie snacks as your dinner option. Go outside for a brisk walk or jog. It burns more calories to keep the body warm when it’s cold outside, so don’t let the cold prevent you from working out. Consider walking to work instead of taking the bus, and instead of delivery, try going outside to buy lunch. “X” Burpees: While doing a traditional burpee, as soon as you get up, jump into an X with arms and legs spread instead of straight up. Raised Planks: Go into traditional plank pose with elbows on the ground under your shoulders, hands as fists. Raise your hips up and then back down in beginning pose. Repeat 3-5 times. On the last rep, hold plank pose for 20 seconds. Crescent Kicks with Lunge: Using the back of a chair or standing foam roller, stand a few inches away and kick over the chair and end in a lunge position. Do 10 reps for each leg.